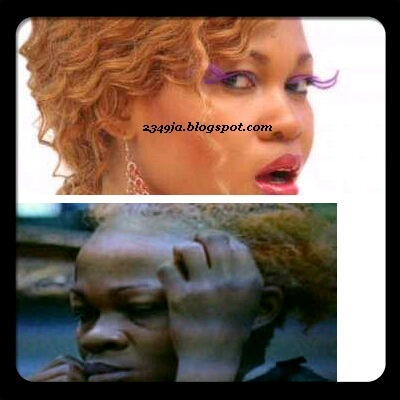 Nigerian Pop star and representative at BBA Goldie looks terrible without the Makeups. Because of the marketing power from the advertising media, Women are seduced into using makeup as teens. It affects their body's ever changing chemistry and becomes a vicious, self destructive, self loathing cycle that ends up making some of them look old and ugly on the inside and out. It can be compared to using synthetic oil in your car, once you start you can never stop or it will ruin your engine. Maybe am wrong, But there are pictures from the reality tv show that backs up my theory above. See below. Bottom line, ladies, Using these beauty enhancers would do a lot of damage in the end, Being natural is beautiful, Be proud of WhatGod gave you and stop being artificial. I bet many girls with artificial coverings would even look worst than this photo.This brings us to another argument ,that men are more pretty than women because almost all the women you see today are fake. Fake hair, fake nails, fake busts, fake but, fake smiles, fake everything. It appears you didn't get the story line well. ""Because of the marketing power from the advertising media, Women are seduced into using makeup as teens. It affects their body's ever changing chemistry and becomes a vicious, self destructive, self loathing cycle that ends up making some of them look old and ugly on the inside and out'' It can only be inferred that Goldie used these artificial beauty products and this is the result after some time. Ok maybe I was a bit harsh and I apologize but I disagree that women enhancing themselves with makeup should be ridiculed. We all do it to some extent.